This past week, we had Amy here to work on our backyard. Amy has been studying permaculture, recently completing an intense permaculture design course at Bullock's Farm on Orcas Island. 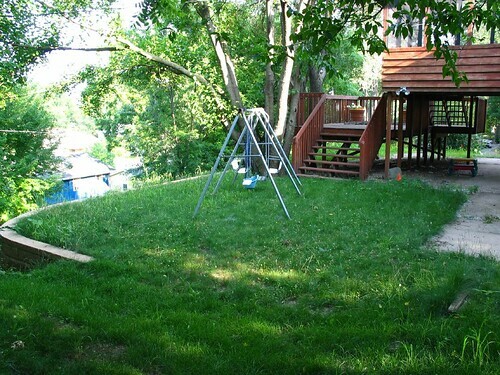 Prior to Amy's visit, we had several problems with the layout of our backyard. Our house sits on a hill; the grade is approximately 30 degrees down in the backyard. 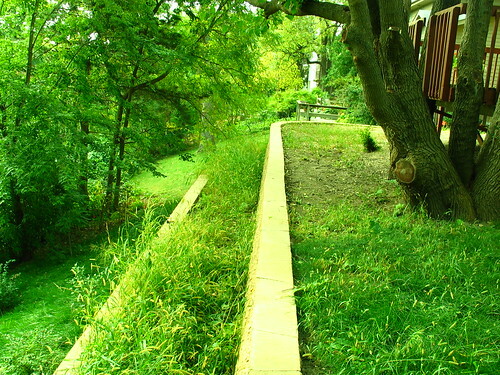 The previous owners had installed two terraces below the deck, resulting in essentially three sections in the backyard: the top section, with a flat grassy space, a deck, and a gravel-covered spot; a middle terrace; and the lower grassy area (still on a 30 degree angle) with some bushes and trees. Clearly some things needed to be done. Obviously the gravelly area was a little uninteresting, even drab; also, the upper terrace could be considered dangerous for a toddler, especially a fearless one that runs around like a little madman. The middle portion just needs something done to it, and the lower section still requires mowing, which is not good given the angle of the hill and the difficulty in getting down there. As well, that section gets a lot of water, and it grows massive 6 or 7 foot weeds. So, our plan was to build a fence, then have Amy design and install plants, trees, and shrubs, etc., and any necessary agricultural infrastructure for moving water around. First we worked on the fence. It was a challenge even deciding what kind of fence to use, and beyond that, exactly where to put it. We bantered about with the ideas of putting in chain-link fencing or wood, whether or not to use treated wood or cedar, etc., and eventually decided that we liked best the idea of using all cedar fencing. Although treated lumber no longer includes arsenic, it still contains a number of chemicals that may be harmful, including "inert" chemicals that bioaccumulate as they are fat soluble. Anyway, that was the primary reasoning for not using treated lumber. It's a little bit of a gamble, admittedly, but it's really nice wood, and cedar withstands rot very well comparatively. Installing the fence was another matter. We initially marked out the fence with stakes, lines, and the like, and rented a hand-powered post hole auger, one of the type you twist, not the clamshell variety (neither of us liked the idea of using that). We had a lot of trouble digging these holes. Not only is the mulberry nearby a big problem with an extensive root system, but we have a hardpan about 6" into the ground that is all clay - really hard stuff, and we just didn't think we could handle it after trying one hole. So, we decided to go rent a power auger. The aforementioned rain did clue Amy in to a problem we were having with water near where we wanted that fence. 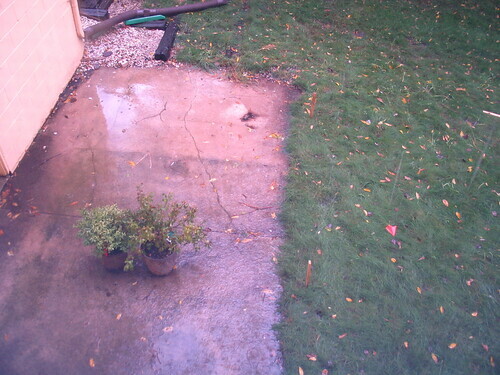 Right where I took that picture, you can see that there is a lot of water building up on the concrete patio. Unfortunately, there wasn't really anywhere for it to drain, so it was building up next to the house and probably just seeping down underneath. 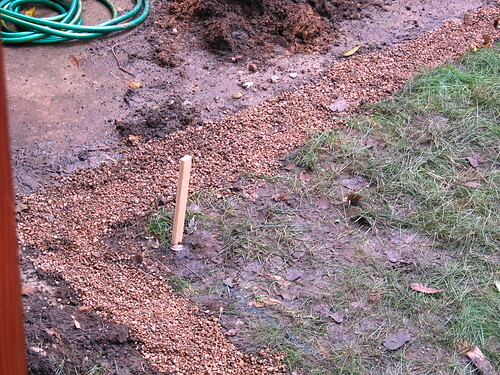 That's really not a good thing, so Amy decided to install a French drain system, in this case by digging trenches and filling them with the aforementioned gravel. 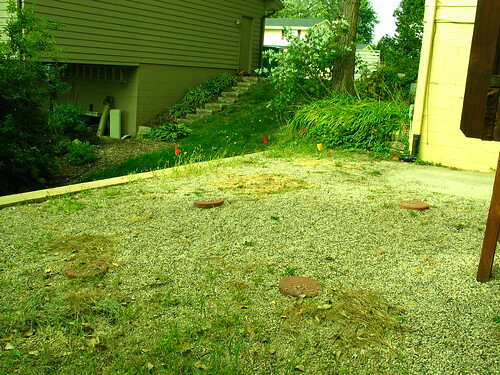 What you see in the picture at left (underneath the stakes) is an abandoned gas pipe. While Amy was digging, she inexplicably ran into a pipe and smelt gas. Believe me, we had called to have our pipes marked, and there wasn't supposed to be a gas line there, so we were rather confused. I shut off the gas line, and we called the gas company.... they came out and said it was abandoned and probably originally powered somebody's outdoor gas grill. Much ado about nothing, but it could have been messy. Anyhow, back to the fence. How did the power auger work? Well, the photo can do the talking. After a couple of holes, we still were having a ton of problems with the clay and the tree roots. The auger eventually got stuck in it all here on this hole, and it took us several hours to get it out. Usually you can take the top off the auger, get out a pipe wrench, and turn the threads back counter-clockwise to get it out, but as it turned out, the root it was stuck in managed to get lodged both above and below the thread, and it wasn't going to move. 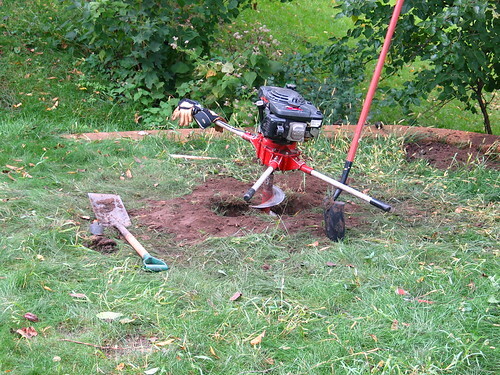 Instead, I had to dig a 3-foot hole next to the first hole, break the root, and then take it out. It was a big pain, and we had so much else to do, we just gave up. We decided to take the auger back, and get to work on the other stuff--have somebody else install the fence later. Another thing that Amy noticed is that on one side of the house, we actually had three different water sources all sending water down the same pathway... one from our neighbors' drainage system, one from our roof, and now our new French drain system. So, to take advantage of some of that water and help with erosion, she installed a small set of swales. Installing a swale system involves digging a trench on contour with the hill and building a berm, or hill, on the downhill side of the swale. 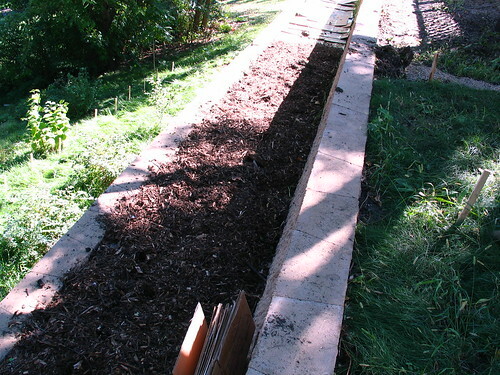 Since the trench is on contour, the water has nowhere to travel but into the soil, and you plant things in the berm to take advantage of the water that is taken in. 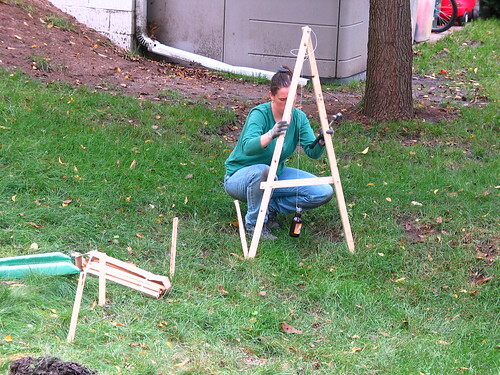 Here's Amy using an A-frame device to place markers on contour. 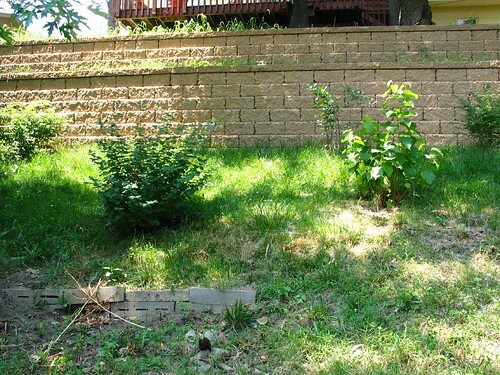 After it was done, the swale system & plants looked like this. 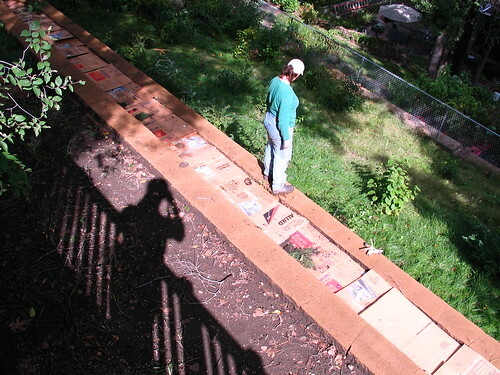 The next thing was to do something with the gravelly area on the South side of the deck. Amy put in trees, perennial herbs, and the like, and discovered an interesting way to use the gravel to our (and the plants') advantage. 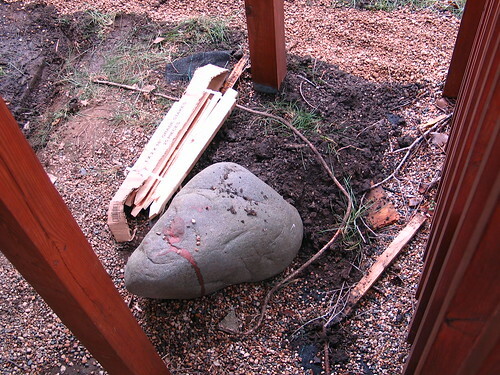 The gravel was shaped into one side of a mound system for the perennials around the trees, providing space for a walkway while also providing a little protection for the tree and a little "found" radiant heat for the small plants. It was nice to think that the gravel that seemed to annoying could actually come in to good use. 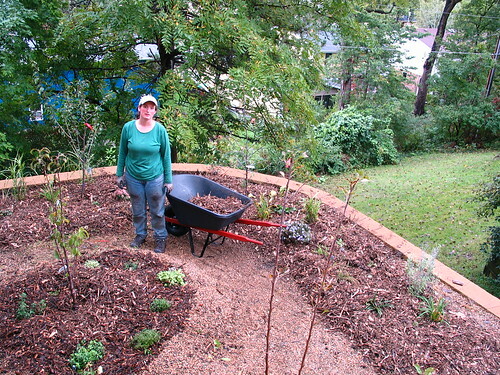 Next we set about sheet-mulching the second terrace. We had a ton of cardboard boxes sitting around attracting mice in our garage, so that came in handy. 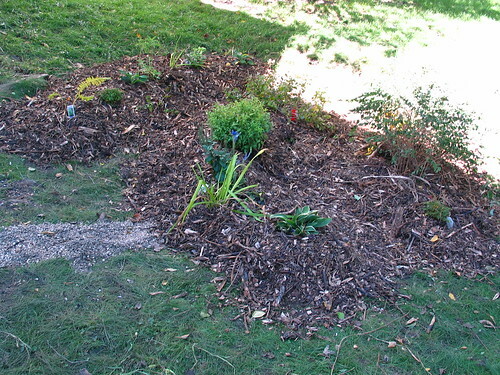 After mulching, it ended up looking like this. We also started building a large swale across the lower section below the terraces, but weren't able to finish it before Amy left, so we'll have to figure out how to get that in sometime. We had more rain (did I mention the rain?) but we felt we got a lot done despite all of the little problems. Interestingly, we had a frost the night before Amy left, but it looks like the plants and trees did okay. Now we just have to figure out how to get that fence in!